This page covers the author of The Power of the Dog. For other authors named Don Winslow, see the disambiguation page. Don Winslow has 1 media appearance. Michael Connolly on The Cartel: “The Cartel is a first rate edge-of-your-seat thriller for sure, but it also continues Winslow’s incisive reporting on the dangers and intricacies of the world we live in. there is no higher mark for a storyteller than to both educate and entertain. With Winslow these aspects are entwined like strands of DNA. He’s a master and this book proves it once again.” This sequel to The Power of the Dog continues Don Winslow’s epic story of the Mexican drug war, and the United States “war on drugs” of the past four-plus decades. Don will discuss the futility of the drug war, and his film work in progress with Shane Salerno. Join New York Times bestselling author Don Winslow as he heads a line-up of talented mystery authors who’ll read from their works, share stories and libations in the inaugural San Diego Noir At The Bar. Also reading are Lisa Brackmann, author of Ellie McEnroe thrillers; Ken Kulken, author of the Tom Hickey crime novels; Debra Ginsberg, memoirist and suburban mystery author; Jeri Westerson, author of the Crispin Guest Medieval Noir series; Matt Coyle, author of Rick Cahill crime novels; and Cameron Pierce Hughes, contributor to San Diego Noir. Don Winslow-"The Kings of Cool"
U-T Talks presents: Don Winlsow, Bestselling Author of Savages. Join the UT San Diego and Warwick's for an evening with Don Winslow, on Wednesday, July 11th at 7:30pm, where he will discuss and sign The Kings of Cool. There will be limited reserved seating available, please call Warwick's at (858) 454-0347 for details. Please note that online reservations will not be available after 5:00pm on July 10th. In Savages, Don Winslow introduced Ben and Chon, twenty-something best friends who risk everything to save the girl they both love, O. Among the most celebrated thrillers in recent memory, and now a major motion picture directed by Academy Award-winning filmmaker Oliver Stone, Savages was picked as a best book of the year by Stephen King in Entertainment Weekly, Janet Maslin in The New York Times, and Sarah Weinman in the Los Angeles Times. Now, in this high-octane prequel, Winslow reaches back in time to tell the story of how Ben, Chon, and O became the people they are. Spanning from 1960s Southern California to the recent past, The Kings of Cool is a breathtakingly original saga of family in all its forms--fathers and sons, mothers and daughters, friends and lovers. As the trio at the center of the book does battle with a cabal of drug dealers and crooked cops, they come to learn that their future is inextricably linked with their parents' history. A series of breakneck twists and turns puts the two generations on a collision course, culminating in a stunning showdown that will force Ben, Chon, and O to choose between their real families and their loyalty to one another. Fast-paced, provocative, and wickedly funny, The Kings of Cool is a spellbinding love story for our times from a master novelist at the height of his powers. It is filled with Winslow's trademark talents--complex characters, sharp dialogue, blistering social commentary--that have earned him an obsessive following. The result is a book that will echo in your mind and heart long after you've turned the last page. Don Winslow reads from Satori. Don Winslow liest aus seinem neuen Roman "Tage der Toten"
Don Winslow reads from "Tage der Toten". Don Winslow discusses The Power of the Dog. Southern Cal author, Don Winslow returns to Warwick's on Wednesday, June 11 at 7:30pm to discuss and sign his new novel, The Dawn Patrol. But Boone is also obsessed with the unsolved case of a young girl named Rain who was abducted back when he was on the San Diego police force. He blames himself — just as almost everyone in the department does — for not being able to save her. Now, when he can’t say no to a gorgeous, bossy lawyer who wants his help investigating an insurance scam, he’s unexpectedly staring at a chance to make some amends — and take some revenge — for Rain’s disappearance. It might mean missing the most colossal waves he’s liable to encounter (not to mention putting The Dawn Patrol in serious harm’s way as he tangles with the local thuggery), but this investigation is about to give him a wilder ride than any he’s ever imagined. Pictures from Don's last event at Warwick's. Don Winslow , California Fire and Life. 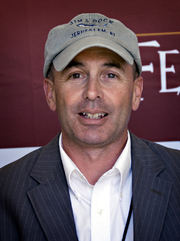 Don Winslow is a LibraryThing Author, an author who lists their personal library on LibraryThing. Don Winslow's book USA Noir was available from LibraryThing Early Reviewers. "Don Winslow" is composed of at least 2 distinct authors, divided by their works. You can edit the division. Don Winslow is composed of 2 names. You can examine and separate out names.